The LG Doubleplay is pretty unique in the way it handles the physical slide-out QWERTY keyboard. Separated by a screen right in the middle, it reminded us of the Nokia E70, one of the first QWERTY devices that caught our eye back in the day. We’ve seen the Doubleplay before - it appeared as the LG Flip II back in June, but now we have the official press shots. Combine this with a leaked T-Mobile roadmap, saying that the device is coming on November 2nd, and you arrive at a pretty clear picture of what’s to come. Of course, nothing is sure until we hear an official confirmation from either the carrier or LG. The LG Doubleplay itself comes with a dual-screen setup: the main screen being one sporting an HVGA (320 x 480 pixel) resolution and the secondary screen noticeably smaller. That secondary display allows you to quickly access some apps like messaging for example, but we’re short on further details. On the back, there’s a 5-megapixel camera equipped with LED flash. On the software side we have Android. Overall, nothing groundbreaking in terms of pure silicon, but still it’s nice to see more experimental designs for phones and the Doubleplay is exactly that. It’s expected to come with a price tag of $150. I actually like the design for this phone, anyone else? I second that. I'd love to try out this keyboard! LG innovate again! i find devices like this frustrating. i would MUCH rather see LG focus their efforts on making their top tier devices better and more affordable than on developing gimmicky second tier phones that just dont make much sense. sure its a neat idea, but really this device doesnt have a great primary screen, doesnt have a great qwerty keyboard, doesnt have a great camera.... it doesnt really do anything great except the gimmick, which doesnt really add much. and all that for only a little bit less than their top tier options? why bother? With ya on this one. I will give points on trying to be original, but really - haven't manufacturers learn from the Echo? Performance, not gimmicks, wins. How do you make this a high end Android? Answer: you don't. 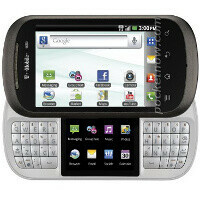 Like the Facebook phones, the flip with a full keyboard, ect. I think LG has come to the conclusion that they really can't compete with the big dogs in the Top Tier device category. They have always had moderate to great success with entry level to mid range devices, so I can see why they put much focus on gaining more ground in that department since they have proved themselves. Granted, if they hit it big one time with a top tier phone it could take them to a whole other level but with economies being the way they are, I think they are playing it smart by offering devices that can be sold at lower prices and quickly be accepted versus trying to match HTC, Samsung, Moto, and Apple with the really high end offerings. At first, my reaction was 'Oh, that's kinda cool.' But the more I look at it the less functional I imagine it. One word in particular comes to mind and that is 'unnecessary'. This is the future, and you guys are supporting this kind of thing they put out. No wonder Tmo is the state that it is. Unique to say the least, but I'm not trading in my G2x.